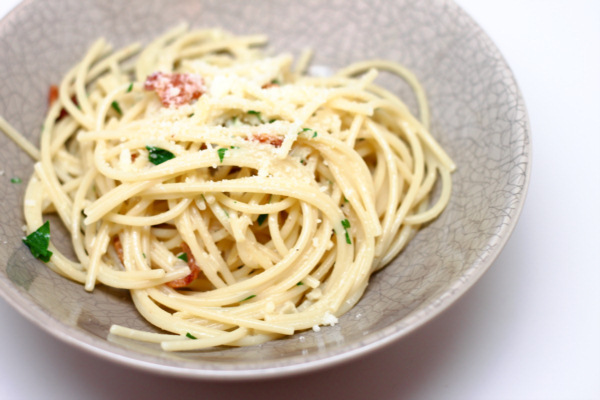 This recipe makes up a wonderfully flavorful sauce – anything with bacon is good in my book ! Cook pasta according to package instructions. Drain reserving ¼ c of the cooking water. Mix milk, cheese, parsley, salt and pepper. Heat a skillet and spray with Pam then sauté pancetta 3 minutes. Add onions and garlic and continue cooking another 5 minutes until onion is browned. Reduce heat to medium low and add milk mix and spaghetti to the pan. Whisk egg in a bowl and add the reserved cooking liquid stirring constantly so egg does not start to cook. Gradually add to pan stirring constantly and cook 4 minutes on low until sauce is thick. 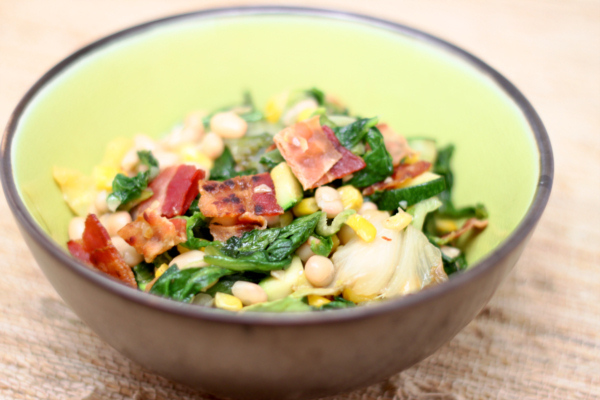 I have a lot of recipes pairing white beans and escarole – but this one is just a bit more – this one adds extra veggies and the dish is totally different than plain old sautéed escarole. The creamy texture of the beans just goes great with the crisp zucchini and corn. Heat a large skillet and spray with Pam. Add escarole and cook 6 minutes to wilt. Remove and set aside. Cook bacon 2 minutes then add zucchini and cook 4 minutes. Add garlic and corn and cook 1 minutes. Add back the escarole then mix in parsley, beans, salt, pepper, garlic powder, vinegar and oil. Toss well and serve.